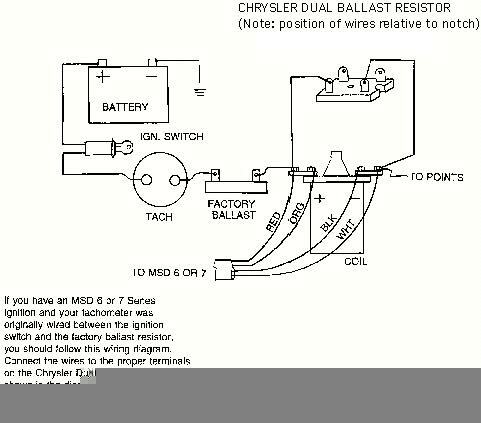 Below is a wiring diagram that shows you how to use a Chrysler Dual Balliast Resistor, to hook up the standard tach in a 240Z. If you have an MSD 6 or 7 Series Ingition and your tachometer was originally wired between the ignition switch and the factory baliast resistor, you should follow this wiring diagram. Connect the wires to the proper terminals of the Chrysler Dual Ballast Resistor as shown in the diagram. Use the half hole on the end of the Chrysler Resistor as a reference.